A Boilermaker supporter through and through, Mark Needham has been a loyal Purdue employee for over 30 years. 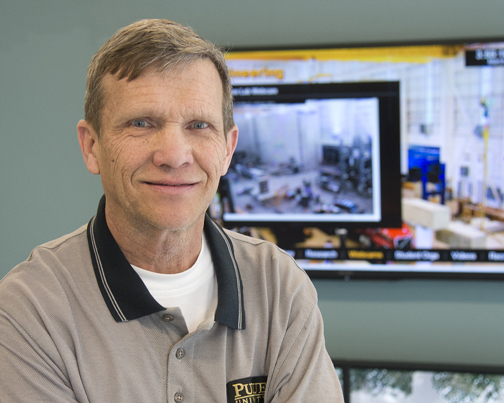 Originally an employee of Purdue Memorial Union, Needham, now a Building Services crew chief, returned to Purdue in 1983 after a brief job change and has been here ever since. In his second year as crew chief, Needham takes pride in his work to keep Hampton Hall of Civil Engineering and the academic wing of Lambert Fieldhouse clean environments for faculty, staff, students and visitors. What do you do as crew chief? I order supplies, plan and organize scrubbing schedules, hand out work assignments and still do a little bit of training. I run the custodial areas when there are vacancies. I do building area inspections, run about every piece of floor equipment there is to keep the halls clean and I try to manage the day-to-day of the building. I work with customers to ensure that their needs are met and issues are resolved promptly. I enjoy the customers, the students. I enjoy the people aspect of working here because the campus is really diverse with different people and visitors that come to campus. I've actually enjoyed the summer months, too, because that's when you have the prospective students coming to campus. You have parents asking you different questions like, "Wow, this is pretty clean. How do you guys keep it so clean?" I enjoy the interaction we have with the different people that come to campus. What do you think are some of the benefits of working a night shift as opposed to a day shift? I can get a lot more done [outside work] during the day. I have a lot more free time to do the home stuff like yard work and paying bills. During the football season, I attend a luncheon that Coach Hazell puts on. If I worked a traditional shift, I wouldn't be able to do that. On the other hand, I like going to basketball games, and I miss out on that because of the shift I work, too. Purdue is very flexible with their employees, though. I'm just a block and a half away from Mackey, so if I wanted to go to a ballgame, I could take a couple hours of vacation and go to the game, then come back to work. I've been on this shift since 1983 now, and I don't know that I'd want to change. Why is being here every day so important to you? I feel that we're all a team here, and if I'm not here, I don't want to let them down. Some employees look to me for leadership. Vacation is one thing, because I can let them know ahead of time. They can let me know of any problems before I leave, and I can try to solve them, but if I'm not here unexpectedly, I feel like I'm letting them down. In July, I will have gone two years without using any sick days. I've got one employee that is working on three years perfect attendance, and another one two years. I think that says a lot that they also enjoy coming to work. They enjoy working for me, and I in turn enjoy being their crew chief. I go to Minnesota once a year to go fishing. Purdue athletics is also a big part of my free time. I enjoy tailgating before the games. That's an event for me. I usually start planning my tailgate menu in April. I'll look at the game schedule and say, "We're playing this team, and this is what we usually do for them." I have done everything from omelets in a bag to a fish fry with all the trimmings. This usually takes place a couple of games after I get back from Minnesota. Brats are normally reserved for when we play Wisconsin.